They’re keeping the warbling V6 – yippee! Easy Fill Tire Alert: Why didn’t we think of that? The new Altima tones down its sportiness: gone is the manual gearbox – replaced exclusively by a CVT – and the suspension is more accommodating, at least on the V6 version. Instead, there’s a glut of technology and the outside – and the inside when it has leather upholstery – have been upgraded so much that the car wouldn’t look out of place in an Infiniti showroom. It may not seem like it, but the Nissan Altima will be celebrating its twentieth anniversary and its fifth generation with the arrival of the new model this summer. However, the 2013 generation doesn’t include any earth-shattering changes. The rear suspension has been updated (still multi-link, but now with ZF Sachs dampers) and it now features Active Understeer Control (Nissan says it’s a first for the category, but the Ford Focus has it too – they call it “torque vectoring”). The Altima is also 35 kilos lighter, thanks to the widespread use of aluminum and high-resistance steel. So the new Altima can boast being the lightest in the category. Oh, the steering has gone from hydraulic to electro hydraulic, but the trade-off doesn’t completely eliminate the connection between road and driver. In fact, Nissan’s mid-size gives the driver as much feedback as the Volkswagen Passat and much, much more than the Toyota Camry and Hyundai Elantra. Just like the Murano and the Quest, the Altima is still built on the D platform. It’s 3.5 cm wider, but otherwise the dimensions are roughly the same. The wheelbase, at 2,775 mm, is identical. Its dimensions are about average for a mid-size car, which means that it’s not too big and not too small. The back seats are reasonably roomy and the 433-litre trunk is respectable. But make no mistake about it: this is no Klondike. Some compacts out there, like the Chevrolet Cruze for instance, are just as roomy. There are no revolutionary changes to the drivetrains either: no fuel injection and no turbo. The 2.5-litre four-cylinder and the 3.5-litre V6 remain, although a variable air intake has been added to the four-cylinder for a modest 4% increase in power (now 182 horses). The V6 continues to produce 270 horses and both engines are promising fuel consumption savings to the tune of 15% for the four-cylinder and 10% for the V6. A 15 % reduction in fuel consumption is enormous. If the always overly optimistic figures from Natural Resources Canada are to be believed, that means 5.0 L/100 km on the highway. Our testing wasn’t extensive enough to be conclusive, but if we’re correct, it will make the Altima the most frugal mid-size out there, with the obvious exception of hybrids and diesels. Of course, once the new generations of the Honda Accord and Ford Fusion come out, you can bet that we’re in for a real battle for the title of most fuel efficient car. A hybrid version should eventually return to the Altima line-up (a coupe, but in meantime, we’ll make do with the current generation), except that with these fuel consumption numbers, you have to wonder if a hybrid is really necessary. Take a look at our photo gallery: what do you see? If you’re like us, you’ll find that these new muscular and slender curves represent a radical departure from the good old Altima design in favour of something very much like an Infiniti. While it may be a tad anonymous, all that chrome gives it a classically elegant and timeless look. The upholstery in the base versions is a velour-like fabric that resembles a dust cloth and it’s going to be even more unpleasant to sit on, especially on those hot, sticky, summer days. On the other hand, versions that have leather interiors are reminiscent of an Infiniti, especially when you factor in high quality materials, remarkable soundproofing (apparently 30% more than before) and very comfortable new “zero gravity” seats that are said to be inspired by NASA. It almost feels like you’re floating. A tip of the hat goes to its larger console with logical and user-friendly commands that are in no way minimalist. Right in front of the driver there’s a very instinctive new display screen that’s practically three dimensional. But there are a few regrets: there’s still no panoramic roof (and Nissan knows a thing or two about the subject), no ventilated front seats and no heated seats in back either. The heated rearview mirrors and the Intelligent Key system don’t come factory standard and we still haven’t heard a peep about a Sport Package. You’ll see later on that although we prefer the Altima equipped with the V6, the bargain – in our opinion – is the Altima 2.5SV. For $27,000, you get 17-inch wheels, dual-zone climate control, sunroof, heated front seats, the first application of Nissan Connect (which reads your texts) and the Easy Fill Tire Alert device. The what? Easy Fill Tire Alert is a device that warns you with a honk of the horn when you reach the desired tire pressure when inflating your tires. It’s flat out brilliant – or idiot proof, as a colleague said sarcastically. We prefer to say flat out brilliant. Okay, let’s get back to mechanics. You need to know what’s responsible for the extremely frugal fuel consumption that they’re promising: the CVT gearbox. The six-speed manual gearbox is a thing of the past. Gone. Ancient history. It isn’t even offered with the base version, which explains why it sells for a little more than that of the competition ($23,700). Nissan, which has sold nine million cars equipped with the CVT to this point, is sticking to its guns: the Altima will only come with its new generation of continuously variable transmission – 40% less internal friction, an extended range, as well as hold and downshifting functions to prevent the yoyo effect. 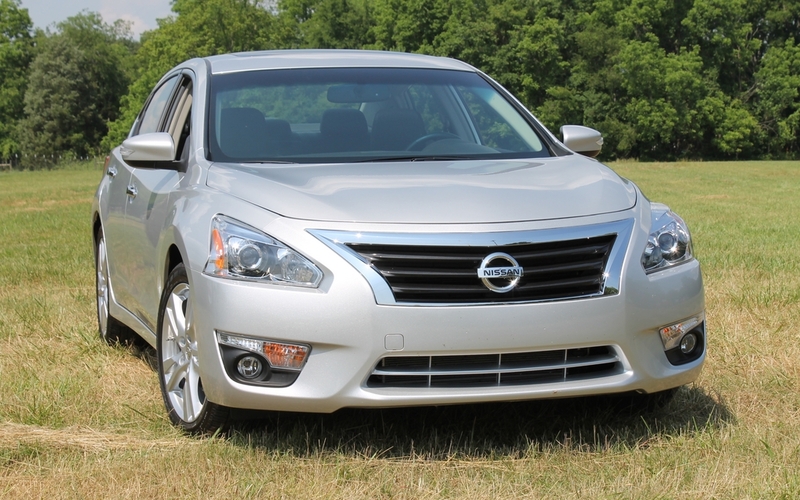 The Altima is indeed more sophisticated, but only with the V6 engine. Is it because they use a chain (instead of a belt they use for the four-cylinder engine)? It is because the adjustments are sportier? Unless it’s because of those paddle shifters that re-create a whopping seven virtual speeds and come only with the Altima’s most powerful engine? With dynamic accelerations, smooth pick-up and the V6’s wonderful and easily recognizable warbling sound, it doesn’t feel at all like you’re driving a car with a CVT in the 3.5. However, you can feel and even hear the CVT in the Altima 2.5. It makes for a less direct ride that revs very high. Wheel mounted shifters would have made the CVT “pill” easier to swallow, but the Altima 2.5 doesn’t have them. And it’s a crying shame. That’s why we prefer the V6 versions, despite their surprisingly softer suspension settings compared to the four-cylinder variations. But even toned down, the new Altima is head and shoulders above some of the terminally boring cars in the category.